Y’all know how much I love jewelry!! I probably have at least five pieces on at all times! When I am travelling (aka. all the time), I need my jewelry with me to feel my looks are complete. I often use jewelry to express my personality because I often have to wear conservative clothes and I don’t feel out of place with some fun earrings or a statement necklace like I would if I was wearing a loud top. To make sure my jewelry stays in great great shape and is easy to find in my suitcase, I use a travel jewelry case to put them in. The two jewelry travel items I use are by Kendra Scott and Stella & Dot. I love the Kendra Scott case when I am going to be wearing a lot of earrings. As you can see of the left there is a lot of holes that you can stick the earrings to. The Elle Earrings from Kendra Scott fit in here perfectly! I also love that you each section of the Kendra Scott is interchangeable and just takes a quick change of the Velcro sections to make a completely different jewelry case, depending on what you are travelling with. When I am not travelling, I use two earring pouches to hold all of my Kendra earrings. I am slightly completely obsessed!I purchased my Stella & Dot jewelry roll a few years ago at a truck show and use it all the time! It is perfect for my week long trips for work. It can hold multiple watches, a few statement necklaces, a bunch of stud earrings and my rings. The center roll detaches and can be thrown into a tote or weekender bag, easily. The roll even has a polishing cloth!! 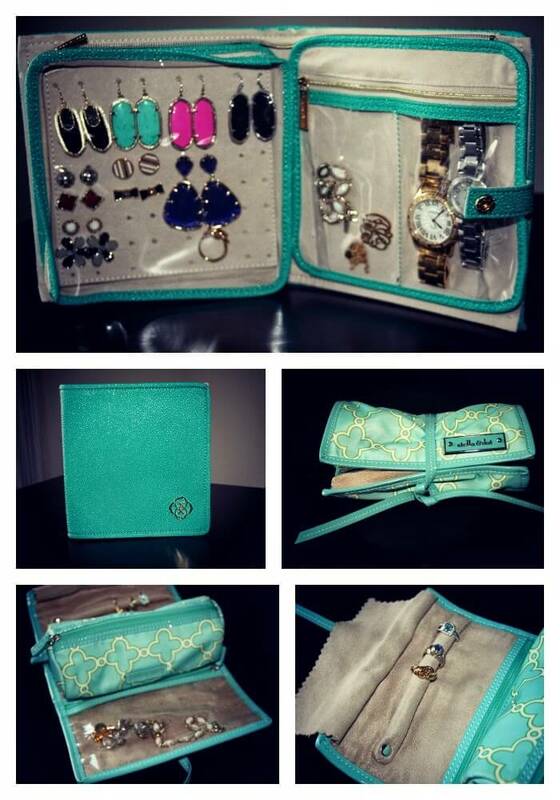 But the main thiing that I love about this jewelry organizaer is the multiple compartments. It keeps all of my jewelry tangle free and allows me to stay organized! What else could I need for a week-long trip?Both of these travelling cases have saved my jewels from getting lost or damaged! Check out these other jewelry cases that I am loving (here and here)! !How do you travel with your jewelry? What is one piece you can’t live without?Please note: This is NOT a sponsored post. All opinions are 100% my own and I would never recommend a product I didn’t 100% love. Thanks for visiting Something Gold, Something Blue Leslie!